It's beginning to look a lot like Christmas, especially on my mantel! This mantel has definitely seen the most action in terms of decor here at my new house. After moving into our new place in early October, the mantel was decorated with a cozy fall theme, then for Halloween, then for Christmas part one, then for Halloween again, then for Thanksgiving and now, for Christmas part two! That's a lot of mantel action if I do say so myself. This year, I've decided to work with a totally contrasting them: a rustic metallic Christmas. One part rustic burlap and plaid, one part shimmery gold and silver, one part traditional Christmas cranberry red. Hopefully that sounds like a recipe for success! And if not, just lie to me and tell me it looks pretty and that I'm not some crazy preggo lady ; ) So let's get to it, my 2013 Christmas mantel. 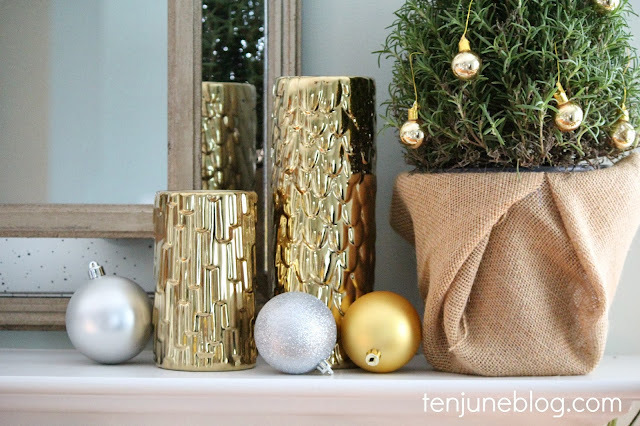 I flocked these gorgeous gold Nate Berkus for Target vases with some sweet tiny gold and silver ornaments. Nate sent me these vases (no, seriously, he did! read this!) and I'm absolutely in love with their color and texture. Perfect for the holidays and perfect for the rest of the year. The silver reindeer and monogrammed stockings (yes, I blurred out H's name and added HDawg myself with the photo editor... I swear I wouldn't put my child's gangster rap nick name on his Christmas stocking... okay, so maybe I would, but I didn't! this time!) are both from Pottery Barn. The felt greenery garland is from the dollar bin at Target. 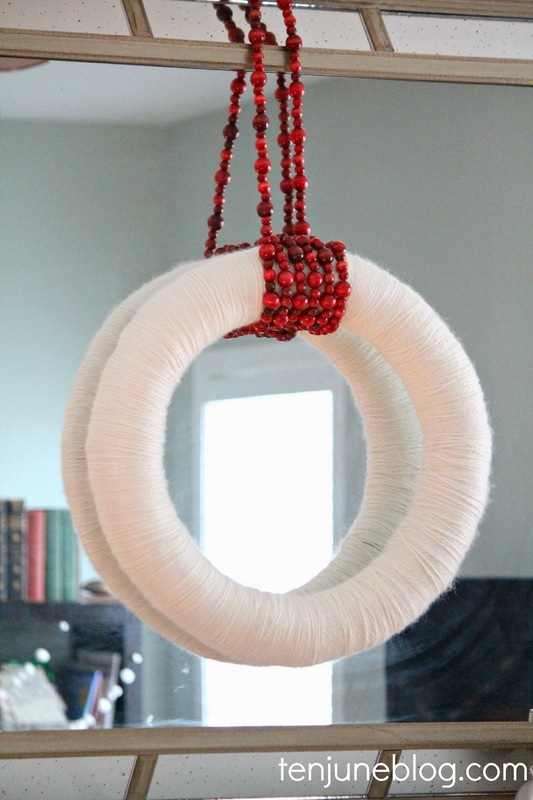 I added my DIY yarn wreath to the mantel as well, layered on top of my new Home Decorators mirror. 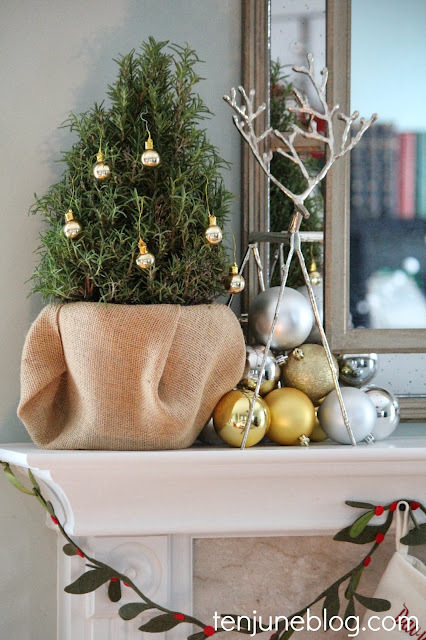 I'm a huge fan of these precious little rosemary bushes I bought and wrapped in burlap. They smell ah-maz-ing. David and I decided not to spend this Christmas battling daily with a 15 month old over pulling all of the ornaments off of the tree, so we decided to put the big Christmas tree in the office. Read: a room with a gate. That means we've only got a small tree in the living room, which I set up right next to the mantel. Hey, a little holiday sparkle is all I need and I'm good to go! Burlap + plaid + cranberry + gold = a winning combination in my book. 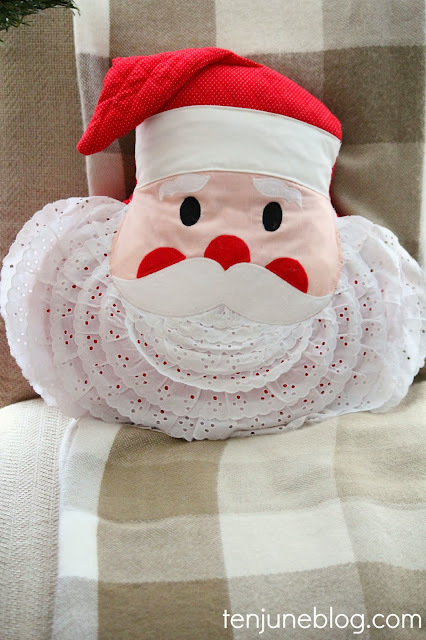 How sweet is this Santa pillow passed down from David's family? HDawg loves it. Ta da! It's a Christmas delight up in here, that's for sure. Now it's time for you to share your holiday mantel this year! 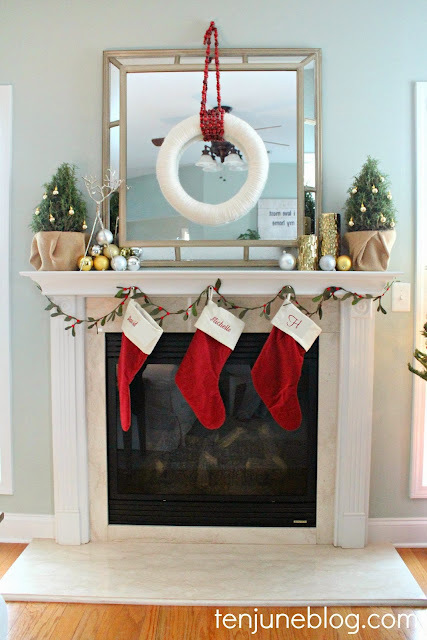 If you don't have a fireplace mantel, feel free to link up any kind of faux mantel you might have (otherwise known as a fantel!). That includes sideboards, ledges and that kind of thing. We don't discriminate when it comes to mantel/fantel decorating. This link party will stay open through Christmas so you can link up your awesome posts whenever you complete them. And don't forget that the party is also live over on Carmel's blog! 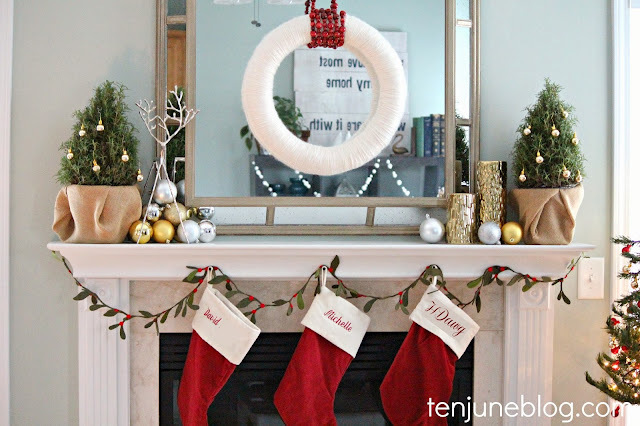 I plan to feature some of my favorite mantels next week in a special edition of Tuesdays at Ten June (mantel style... whaaaaat!) so link up your best and brightest! Grab a button and link on up! Happy mantel linking, friends. Of course you brought the mantel magic, girl. 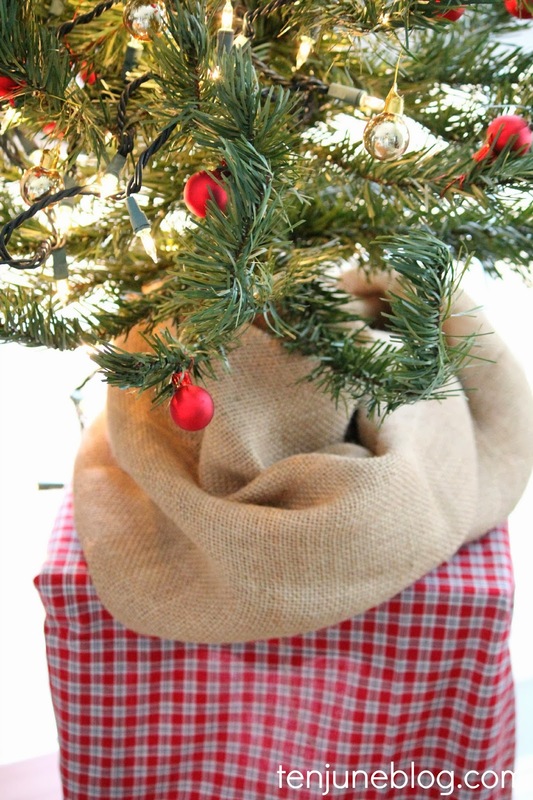 Love the burlap wrapped trees! Very cute! Way to rock rustic metallic! Looks amazing! I love the mini trees up there... I never would have thought of that! girrrrrrl, it looks so good!! I need that leggy reindeer guy in my life! Such a fun party...so much great inspiration linked up already! Woot! The Nate vases!!!!! Do you kiss them every night?! 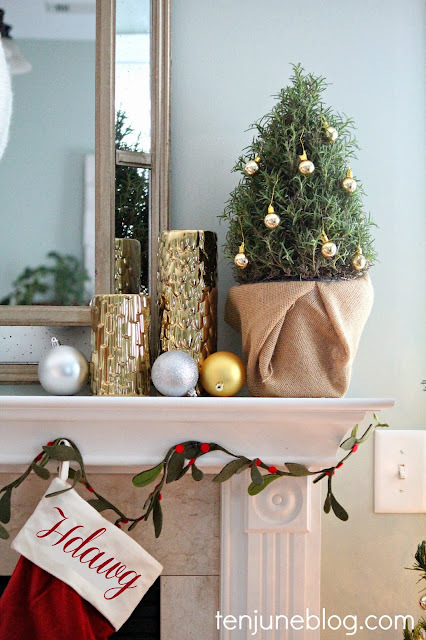 ;) Love the rustic glam vibe and the rosemary trees are too stinking cute! Yes, those vases are awesome! I also love your leggy reindeer-I've got to find one of those some day! And how sweet is that Santa pillow? Everything looks lovely! pretty! i love the combos here! no crazy preggers decisions here, just totally cute! i was so sad when you said the pillow was passed down- i wanted to buy it/make it immediately! we have 2 trees with a 15 month old and i was worried she might be too destructive - she is into everything! thankfully she has left MOST of the ornaments alone haha. when we put gifts under the tree, well that might be another story. 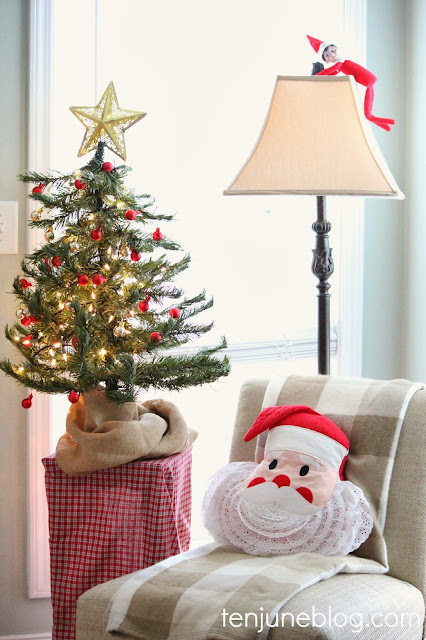 you are smart to gate it off and use the adorable mini tree! Love you mantel! The yarn wreath looks great hung from the red berries! And that Santa pillow is awesome! 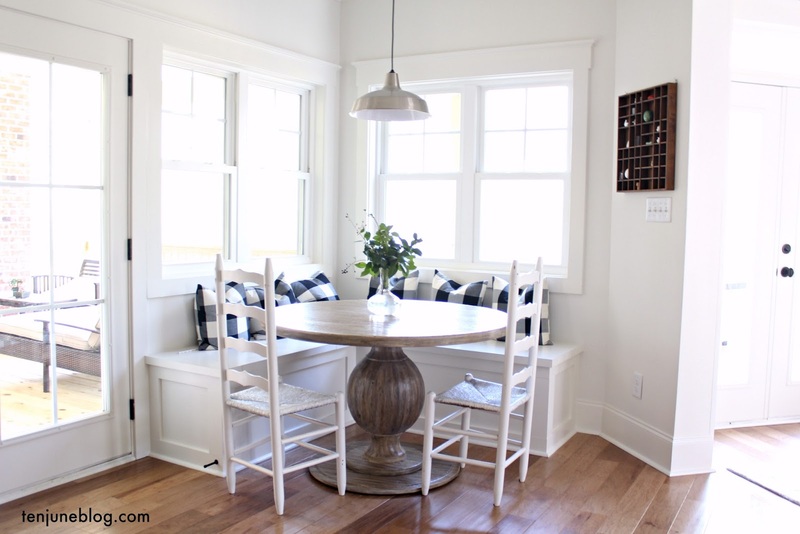 Love how you hung the yarn wreath! It looks so fun and whimsical! I love how it turned out! 5th time's the charm ;) So bright and perfect for the season! Absolutely love it all! It is so light and cheerful and fun!! So fun, Michelle! I love that you used the rosemary trees, what a great idea! And, seriously you are too cool to be on Nate's gift giving list - the vases are perfect on your mantle! Love how you hung your wreath with some beads! Your mantel is lovely. I love the rosemary trees and all the gold. Everything is very pretty! Looks great! Very simple but elegant. so pretty! i love all the elements together! Looks great! Love those trees and the garland! 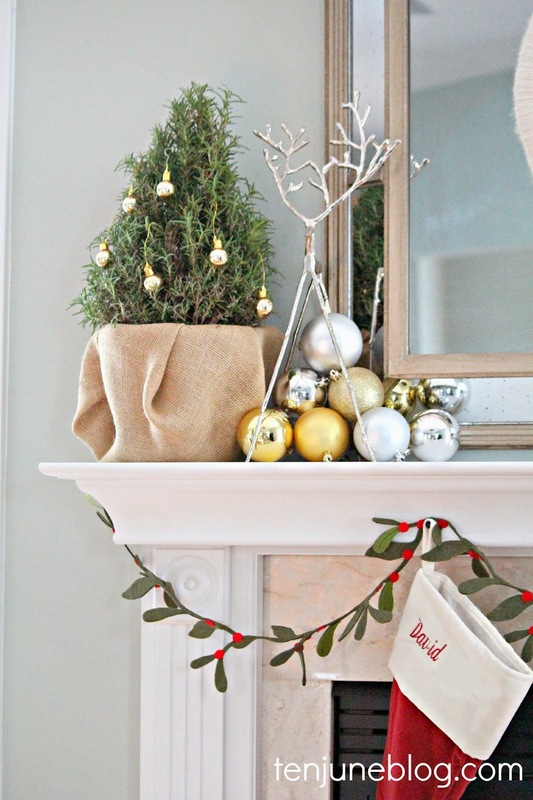 I love all the little things you did to make it your own, like the cranberry garland on the wreath-- so creative! I have the same silver reindeer set, but didn't put them out yet this year because I'm worried my toddler son will weaponize them! And OMG I can't believe Nate Berkus sent you a gift!! gorgeous, gorgeous mantels! such inspiration in these posts. Rustic? Check! Metallic? Check! Rocked it? Check! This is gorgeous, brava friend. That yarn wreath! 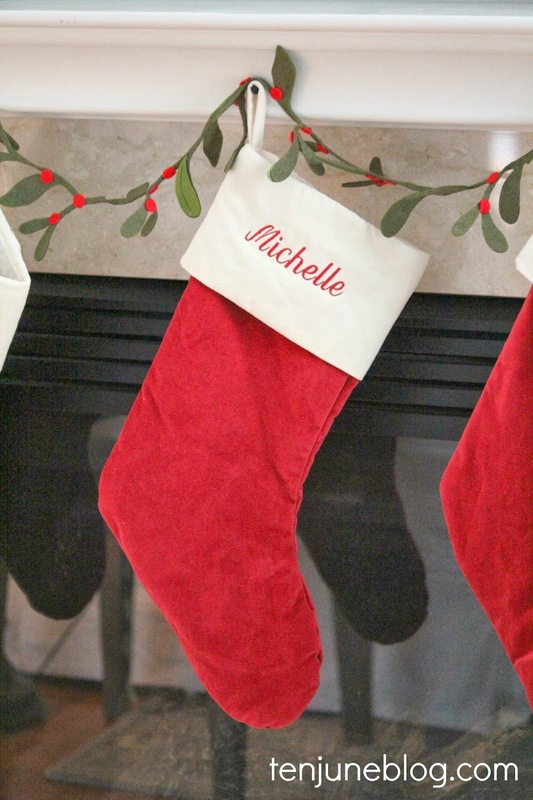 Also, a part of me was hoping you really had that stocking embroidered "HDawg".